Oscar night tomorrow night and I know I’ll end up staying up way too late to watch. After all it is one of the starriest nights of the year. 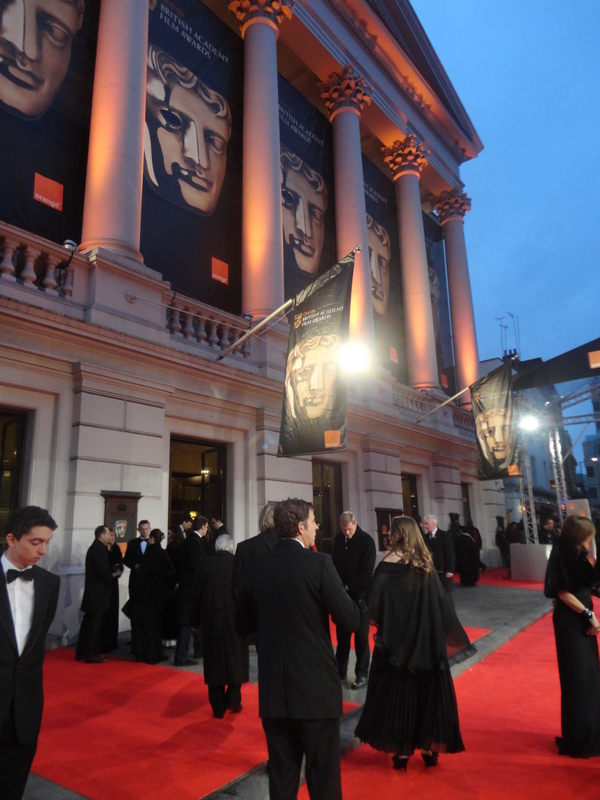 Predictions for winners in a moment but I thought I’d better quickly update on my BAFTA experience. It’s likely to be the last time I go, and it was pretty fabulous. The first thing to say is that the stars are absolutely as gorgeous in the flesh as they are on the screen. In fact, they are better. they kind of glow. They just don’t look like ordinary folk. This year, I was going just for fun and in the company of Caroline Norbury the CEO of Creative England and Chris Moll, Head of Talent for Creative England. And fun it was. Choice of frock is always a bit of a trauma and so I went vintage couture. To translate – that means I bought my dress in a charity shop for £50 and had to get it invisibly darned by the sewing shop in Glossop because the moths had had a go. Walking up the red carpet is a real buzz. You are meant to stride up confidently, signing autographs if you are famous, and moving purposefully on if you are not so that you don’t clutter it up for the important people. So, Chris and I spent a good thirty minutes, star spotting – Jessica Chastain was just ahead of us – and taking photos of each other. I think we narrowly missed being moved on by security. The film world defines heirarchical so once in the Royal Opera House, we were herded upstairs to the members reception, while the stars and financiers mingled down below. After champagne and canapes we took our seats. Behind us was someone from the BFI who shall remain nameless but who spent half an hour telling his date that he was only in it for his MBE….. The games began. Stephen Fry was on fire! I take back all the rude words I have ever said about him. To make it more interesting, Chris and I had a side bet of a pound each on our winners in each category. The French gave the best speeches – everyone fell a little in love with Michel Hazanavicius the Director of the Artist. Gallic charm, a great accent and lots of flattering of British Film will generally do it. Brad Pitt is such a star and so unbelievably pretty that he got a round of applause for just walking on the stage. It was a great night for the ladies; George Clooney, Brad Pitt, Russel Crowe, Hugh Jackman, Michael Fassbender, Colin Firth, Billy Bob… much inappropriate dribbling. Meryl Streep was a shoe in. The best awards are the smaller ones where the recipients are totally delighted to win and genuinely moved. 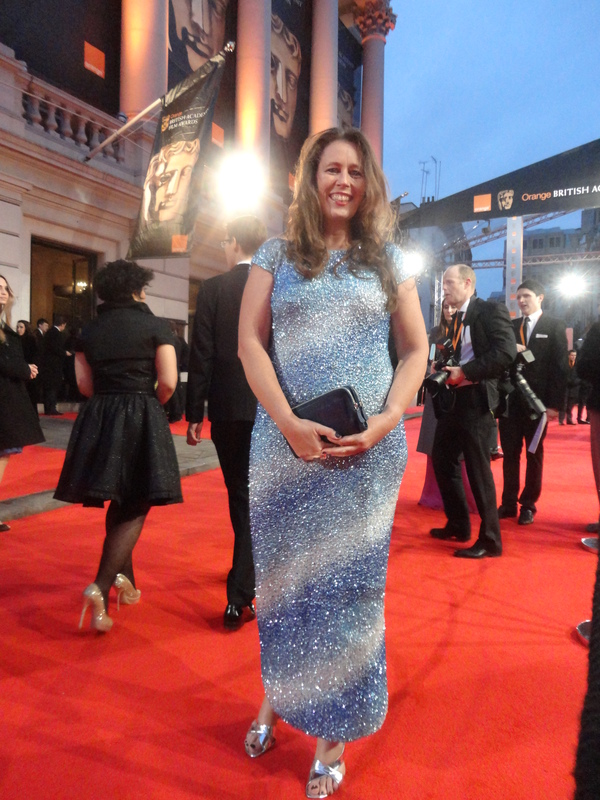 It was hard not to cry when Peter Straughan dedicated his Screenplay BAFTA to his co-writer and wife, Bridget, who died last year. After the awards, infected by the excitement of the Best Newcomer crew who were sitting beside us, and two quid down on the betting, we went outside to queue for the bus and then off to the Grovesnor. 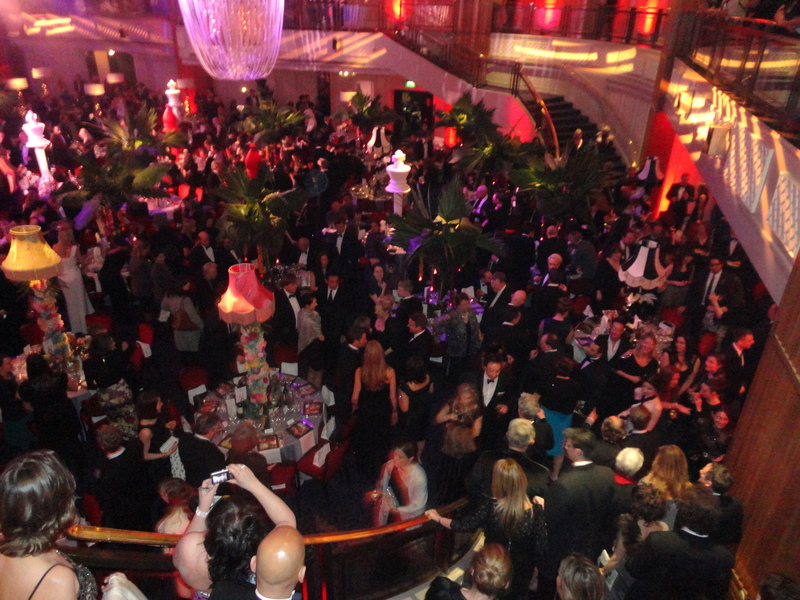 All the tables were decorated with themes from the best film nominees. We were on “Drive” so had crushed golden cars on our lampshade and place mats with Ryan Gosling. Dinner was good: a tartlet, lamb and then a chocolate pudding. With chocolate BAFTA masks, which most people palm for kids at home. By about 1.30m we had had enough and headed back to our hotel for a debrief and some tea in the bar. The vedict? It was a good year. And my predictions for the Oscars.. well I am rubbish at this but I reckon The Artist, Meryl Streep and maybe Brad Pitt for best actor. Sounds brilliant! Could that star glow be achieved by anyone if looking good was a full time job!? So funny how Chris didn’t spot the stars – Stephen Fry is pretty distinctive!